Well, it’s now totally official. 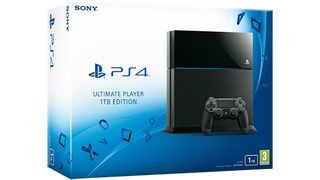 Sony is rolling out a 1TB PlayStation 4 that it’s calling the “Ultimate Player 1TB Edition.” More like ultimate storage, am I right? As of writing, the 1TB version is announced only for “select Europe and PAL territories.” It will launch on July 15 and Sony’s PlayStation Blog says to “check with your local retailer” for pricing. Sony hasn’t yet released a full spec sheet, but this likely matches up with the other CUH-1200 series consoles, which are slightly lighter and use less energy. No word yet on a North American release, but seeing how Sony already registered the console with the Federal Communications Commission, the official announcement seems like only a matter of time. Compared to the current 500GB PlayStation 4, that’s twice the hard disk drive space. It is!